Since pumpkin has returned to store shelves finally, I'm taking full advantage. I stocked up on half a dozen cans and have plans for lots of good stuff. I didn't have time to bake anything (or the need to) this weekend, but I decided to make a pumpkin dip for tailgating instead. Now this might not be your typical tailgate food as it doesnt contain any buffalo sauce, cheese, or alcohol, but it was definitely addictive. 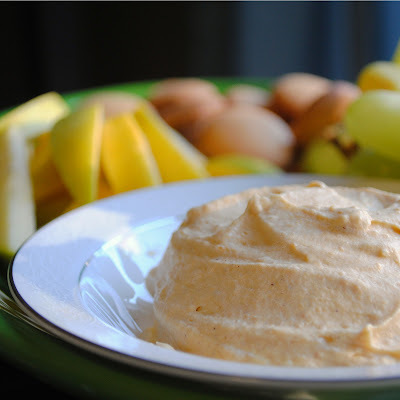 Served with apple slices, grapes, and vanilla wafers, it was a perfect gameday (or anytime) appetizer and it's really easy to put together. If you want to make the dip ahead of time, it will keep just fine in the refrigerator. If you prep your apple slices ahead of time, make sure you toss them with a little lemon juice to keep from browning. Feel free to sub fat free or reduced fat cream cheese in this recipe - I can't tell the difference and neither could anyone I served it too. You could also sub a low fat/fat free whipped topping for the whipped cream (just leave out the powdered sugar) but I used the good stuff because I dont generally have whipped topping on hand. 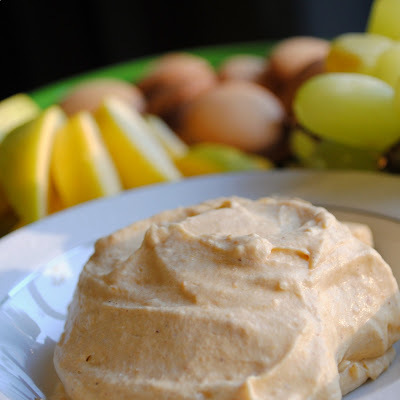 The whipped cream gives this dip a really light, mousse-like texture that's perfect with the fruit and cookies. Beat cream cheese and brown sugar on medium speed until smooth and fluffy. Add pumpkin and spices and mix until well blended. Mixture will be fairly thin. In a separate, cold bowl beat whipping cream with a whisk attachment on high speed until peaks form. Slowly add powdered sugar, one tablespoon at a time until incorporated. Fold whipped cream into pumpkin mixture and serve. If not serving right away, cover and refrigerate. This sounds so good. I can definitely see myself dipping all sorts of things into it. What a great fall dip!!! Yum, I love pumpkin! This looks delicious! I stocked up on pumpkin as well. I figured that if I don't use it this year, it will still be good next year! This looks like such a light and creamy dip, I bet it would good with gingersnaps as well! OMG I just made this yesterday and I absolutely loooooove it!! It should post on my blog mid-November but it's definitely something I will be making and bringing to Thanksgiving and Christmas dinner for my family to enjoy!! I loved that it has easy ingredients that I almost always have on hand!! And I made the pumpkin puree from pie pumpkins and it still turned out ammmaaazzziinngg!! Great job! @catosmom -- glad you liked it! I'm going to try making my own pumpkin puree one of these days but the can is so much more convenient. @Melissa - I'm guessing gingersnaps would be great too!